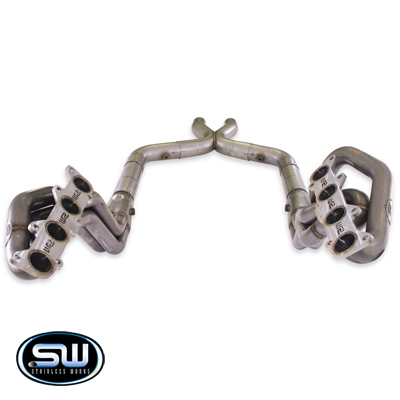 * Stainless Steel Finish 2011-2014 Mustang GT headers with 1-7/8" primary tubes - headers only. Tig welded 304 SS headers with 3/8" thick flanges and 3" dia slip fit collectors with merge spikes. No one else can Stack up to the bold clean styling of our aftermarket Billet / Stainless Steel Dress Ups, Street / Strip / Racing Suspension and Performance Parts for your American Muscle Car! Fits these Vehicles: 2011 2012 2013 2014 V8 GT 5.0L 4V Mustang Roush & Saleen Vehicles. Made in the USA!